Ask hikers to name a trail that begins in Manitou Springs, and most will probably say Barr Trail, the popular path that takes hikers to the summit of 14,115-foot Pikes Peak. Locals, however, might name a smaller, less famous trail that has been a labor of love for volunteer trail builders since 1987. The entire trail is 5 miles one way, but there are several segments if you are looking for something shorter. The Intemann Trail was the dream of the late Manitou Springs city planner, Paul Intemann. He wanted to connect a web of social paths and follow the contours of Red Mountain and Iron Mountain. His dream trail would be a classic urban trail, just skirting the historic town of Manitou Springs. He died in a traffic accident in 1986, and others who knew of him or his idea continued to make the dream a reality. They began fund-raising efforts and trail-building projects over nearly two decades. The Intemann Trail Committee, spearheaded by resident and journalist Ken Jordan, became a fixture, with an ambitious yearly schedule of trail workdays, potlucks and planning sessions. And in 2014, the trail committee had what they called their “farewell tour.” With the disbanding of the group, the trail and its maintenance and care were to be turned over to local governments. Today, the trail stands because of the donation of thousands of volunteer hours. The Intemann Trail meanders for five miles behind and through the historic town of Manitou Springs. 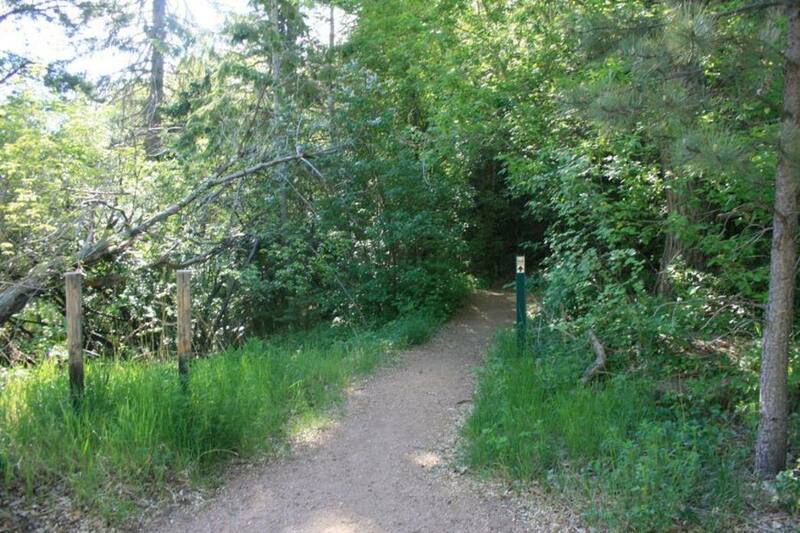 It has six trailheads but it’s easiest to start just off Ruxton Avenue in Manitou. The trail rolls through forest and open sections and occasionally crosses on roads in neighborhoods. To stay on the trail, watch for markers and arrows. For a fun side trip about a half-mile in, watch for the sign for Red Mountain Trail, a spur that leads steeply to the summit of Red Mountain which used to be known for its rowdy dance hall. This trail is easy to get to, and has a pleasing number of options and trailheads. It rolls along in the foothills, and although there are sections that cross over roads in neighborhoods, it’s a great place for a run or an impromptu hike. The main trailhead is at Iron Spring. To get there from Colorado Springs, take Colorado Avenue west. In Manitou, it turns into Manitou Avenue. Continue on Manitou Avenue to the roundabout at Ruxton Avenue, and turn left. The Iron Spring trailhead is the western end of the trail. Start at the lower end of the trailhead at the wooden footbridge and run up Spring Street. You’ll reach a gate; continue through, follow the signs and stay on the trail. You can also get on the trail at the Section 16 trail, Red Rock Canyon, Crystal Park Road, Crystal Valley Cemetery, and Southside Road. 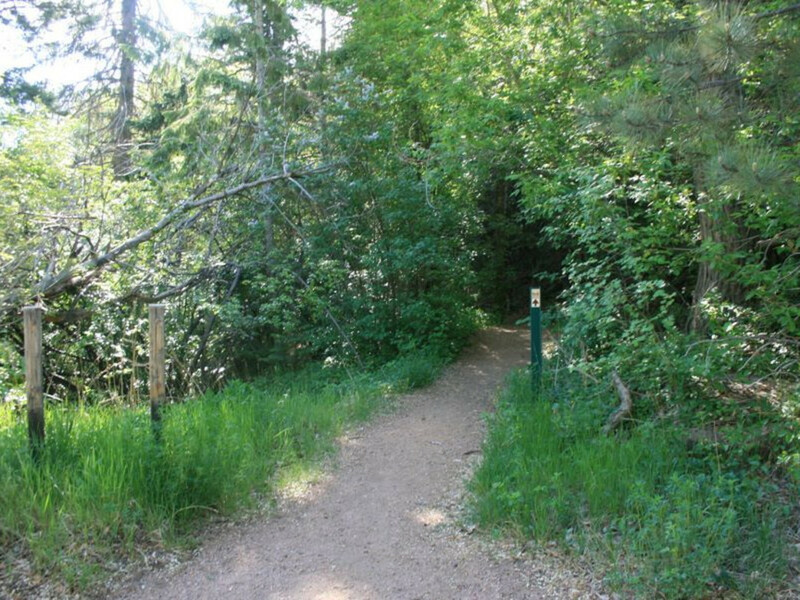 The natural-surface trail is open to hikers, runners and mountain bikers.